Ehab Abdulmutta Jaber, 45, has been charged with one count of making terrorist threats after he slipped into a Worldview Weekend conference in Sioux Falls earlier this month, which featured a message from Shahram Hadian, a former Muslim turned Christian pastor who leads Truth in Love Ministries in Spokane, Washington. Worldview Weekend President Brannon Howse also spoke on biblical prophecy. Jaber had been spotted filming the event with his cell phone in the back of the room and was advised by a security guard that recording was not allowed. The Facebook Live video shows Jaber filming the cover of his Koran before scanning the crowd of approximately 500 people. 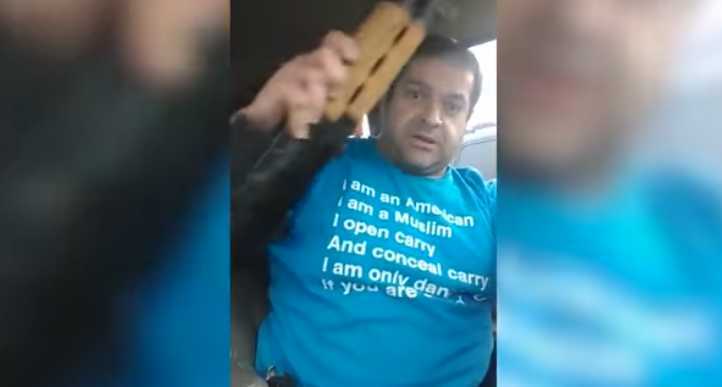 Jaber contended to the news outlet that he regularly travels with the weapons and was simply exercising his Second Amendment rights. “I’m not armed against the regular citizen. I’m not armed against Christians or against Jews, or against women or against children. I’m just armed against stupidity and oppression,” he said. While the Sioux Falls Police Department initially declined to press charges, stating that “everything [Jaber] was doing was legal,” South Dakota Attorney General Marty Jackley and Lincoln County State’s Attorney Tom Wollman concluded otherwise, announcing on Friday that Jaber had been arrested. Jaber is also being prosecuted locally as meth was found in his home during the investigation. Hadian says that he is bewildered both by the conclusion of the Sioux Falls Police Department and the portrayal of Jaber in the media.